Walt, I just looked again at the 1900 U.S. census record for Solomon and Sophie (and Edward) Tulbowitz, and noticed a couple of interesting things. First, the census includes information for "Mother of how many children" and "Number of those children still living." In Sophie's record, the responses are 5 and 3. Second, Solomon and Sophie are both listed as having been married 34 years. That's a lot of years. Since they were 52 and 49, respectively, at the time of the census, they would have been 18 and 15 at the time of their marriage. I don't remember what we know of exactly when and why they left Rezhitsa. Can you remind me? On the number of children, I have Rose, Gavriel, Edward and Yitzhak (who died young). That's four, not five. I'm not sure where my information is from, but I have both Gavriel and Edward with a birthday in September 1876. Were they twins? Also, little Yitzhak (Isai) is 3 years, 5 months at the time of his death in August 1879, which does not compute. There are some mysteries there. Twyla got me started on this today trying to talk up a trip to the Baltics in September. Intriguing idea. She'll have been in Finland with Kate, so maybe I would meet her in Riga and try to take in a circle from Rezhitsa to Kovno to Königsberg. Anyway, that's what got me looking up Rezekne information today and I surprised myself with what I turned up. I'm not sure why I hadn't found the Tulbowitz stuff before. I guess because I hadn't searched the Latvian SIG. By the way, the info that came from Maxim on Tulbowitz in the all Russia census is also in Jewish Gen, but I have a hard time matching those names with the ones from the Rezekne Family List that I sent earlier. My working theory is that our ancestor Sholom Ahron Tulbowitz' father Gavriel had a brother Leiba. The two brothers had sizable families that accounted for most but not necessarily all the Tulbowitz population of Rezhitsa. Piesach's three brothers produced a total of five other sons and at least five grandchildren. Thanks to the Rezekne Family List, I have complete birth dates and spouse names for all of them. Same for Leiba's three sons and their offspring. One reason that branch is interesting is that two of the names Manzik (or possibly Manzin) Tulbowitz (son of Mowscha son of Leiba) and his wife Beila are also on another list of people in Riga with travel documents in 1900. So that establishes that other Tulbowitz relatives of ours made the journey to America, and presumably accounts for the number of Tulbowitz sightings in places like Bayonne NJ and Wilmington DE. Not all came to the U.S.--a Sergio Tulbowitz is a musician and Marcelo Tulbowitz a professor, both in Montevideo. The Jewish history of Rezekne is pretty well documented and memorialized, and there is an archivist who seems to be the major expert. He also does videos about Jewish historical subjects. Here is the catalog. Also late, but congratulations are in order for the latest member of the family to pass through the gates of academe and step into the so-called real world. Twyla completed her undergraduate degree from Barnard College at Columbia University, the same institution (Columbia) where her grandfather Stanley was an undergrad and graduate student. 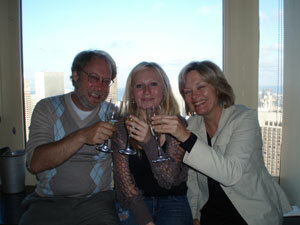 We had a big turnout of Rubys and Eilertsens to celebrate the occasion in New York City. Among Ruby kin, Danny, Joanne, Walter and Tanya, Gene, Janis Brenner and her husband Mitchell Bogart, and Sandy Brenner were on hand for some or all of the festivities. On the Eilertsen side, Kate and Allen, Ed, Judy, and Susie went all out to make the experience special, including at the several special celebratory meals. I was so sad that Stan and Helga could not be there that I broke up trying to say that in a toast at the first celebration dinner. The graduation ceremony was plenty interesting, with featured speeches by Mayor Michael Bloomberg, David Remnick, Anna Quindlen, Judith Shapiro, and others. Billie Jean King was among those who received the Barnard Medal. Twyla walked with the Anthropology department as she was recognized for her double major in Anthropology and English. At a couple of departmental receptions, Kate and I had the opportunity to meet two of the professors who advised Twyla's senior project—Ross Hamilton of the English department and Brian Larkin, the chairman of the Anthropology department. Both had lovely things to say about our graduate. Her thesis, "Made Visible: Scientific Constructivism Through the Lens of Hooke's Micrographia, received a 'A' grade from the two professors. Graduation morning, there was a screwup because I failed to get word to Sandy on where we would meet. She came anyway—solo on the train with Mel in the hospital recovering from a knee operation—but we never managed to find each other. Janis was getting ready to leave for Asia that morning, and the last thing she needed was my frantic call looking for her mother. She ended up missing her flight while Mitchell worked the phones trying to track her down. Turns out Sandy was there for the graduation ceremony and post reception. Then, not finding any of us, she sensibly went home, where she discovered everyone had been looking for her. My apologies for my part in the screwup. Thankfully, everything worked out okay and Joanne took the next day to visit with Sandy and help get Mel home from the hospital. I signed up with a new genealogy social networking site called Geni and have uploaded a recent version of my Ruby Family GEDCOM file, which now includes 325 names of our ancestors and living relatives. 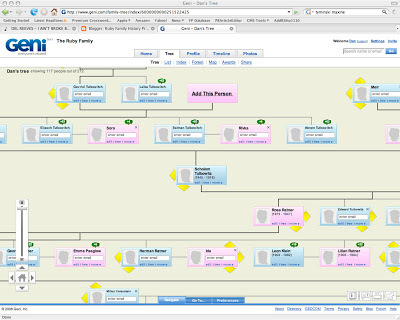 Geni appears to be a really cool system with loads of great features for displaying information about the family as well as connecting with living family members. To get it rolling, I invited immediate family members and so far Walter, Joanne and Twyla have now signed up. I hope they will be active users by updating their profiles and adding new information to the tree. If that happens, then let's start inviting various cousins to join in and see what kind of network we can create. If you want to get started on your own, go to www.geni.com and create a free account. Then do a search for any family member you can think of. Once you find the person, you should also be able to find yourself in the Ruby family tree. Link your account to that listing and you will become part of our social network. Or here's a simpler solution: Write to me at druby@sprynet.com and I will sent you an email invitation to join.